Proud to sponsor a record-breaking event! We were one of the proud sponsors of Lancashire’s Red Rose Awards, celebrating the cream of the county’s business community. We were one of the proud sponsors of Lancashire’s Red Rose Awards, celebrating the cream of the county’s business community, which was held on Thursday 13 March. It is the third year running we have sponsored the event and been involved in the judging process. The 2014 awards ceremony was a record-breaking celebration. 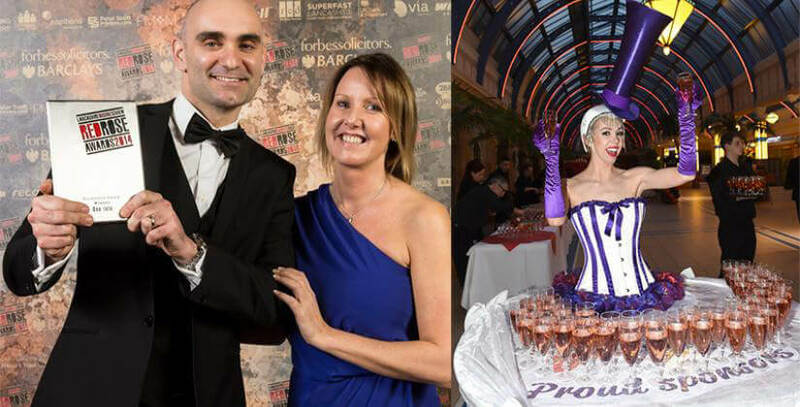 With more than 1,160 guests in attendance, the awards evening at Blackpool’s stunning Winter Gardens saw the largest dinner gathering in a single room ever held in Lancashire. Visitors were welcomed with a drinks reception, sponsored by Bizspace, and our Sales and Marketing Director, Emma Long, was on hand to present the E-Commerce Award to winners, Rossendale-based One Iota. Earlier in the year, Emma also had the task of co-judging three of the categories, by reading through entrants’ written applications and quizzing them after face-to-face presentations. Almost 140 Lancashire businesses were finalists at the event, with 26 being named as winners in their categories. We were delighted to see our business relocations partners, Andrew Porter Limited, receive an award on the night, scooping the title of Growing Business of the Year. And it was great that our co-working partners, Neardesk, were able to come along to the event and celebrate with us on the evening, as well as our PR company, Wyldfire PR and Marketing. Richard Slater, publisher of Lancashire Business View and producer of the Red Rose Awards said: “It was a remarkable night of celebration for Lancashire business. Emma added: “It was a real privilege to be a judge and to find out about more about the strong and supportive business community there is in Lancashire. We are currently trialling a special service for businesses in the Lancashire area that are looking to grow during 2014. Teaming up with our long-standing customer NXO, which has been based at our Preston Technology Centre for 18 years, we are offering new customers moving into the centre preferential rent as well as 12 months of mentoring and guidance. Marketing specialist NXO will deliver one-to-one seminars and group workshops helping businesses to set goals for business growth and work towards achieving them.